In 2011, the Los Angeles Times reported that the United States was the most generous country in the world, and I don’t know about you, but it makes me want to do my part. Suffice it to say, she’s made a majorly positive impact on my life since moving next door to her over a year ago. She’s never given me a donation or a check or anything monetary. She’s just sweet and gives her time as a fellow twin mom, and that’s the greatest type of generosity I could ever ask for. The point is that being generous doesn’t always have to mean donating a million dollars to a university to have your name on the side of a building. Really it can mean just doing something really small that makes someone’s day. When you are on a very tight budget, giving gifts can be difficult. So, if a young couple you know is getting married, cooking and baking might be a great option. You can give them a beautiful card on their wedding day with a “coupon” that’s good for one home-cooked meal (then actually follow up on it!) If you’re going to a baby shower, you can do the same thing and then bring a huge plate of inexpensive lasagna over to the new parents. When I moved to New Jersey and my twins were only five weeks old Shannon from Financially Blonde drove to my house with five large trays of food among other goodies (like cookie cake – can’t forget about the cookie cake!) We had food for pretty much three weeks. It was amazing and the perfect gift for two very tired parents who just moved across the country. 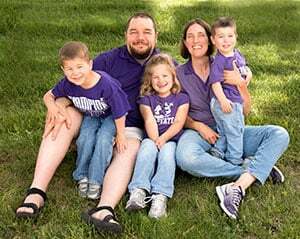 Had Shannon showed up to my house with matching onesies, I would have been appreciative but her generosity in taking the time to make us so many meals was what make her giving nature truly memorable. Ultimately, you don’t want to be so generous that you go into debt or so generous that it throws off your budget and makes your electric bill unaffordable. The point is to really try to find the quiet moments where a small act of kindness or generosity can make a big difference. I try to do this in my life even though I have six figures of student loan debt. Usually it’s just offering someone a helping hand or encouraging someone who needs it. Even though it’s simple, I like that I’ve found a way to live frugally and generous all at the same time. What are some ways you like to help others? 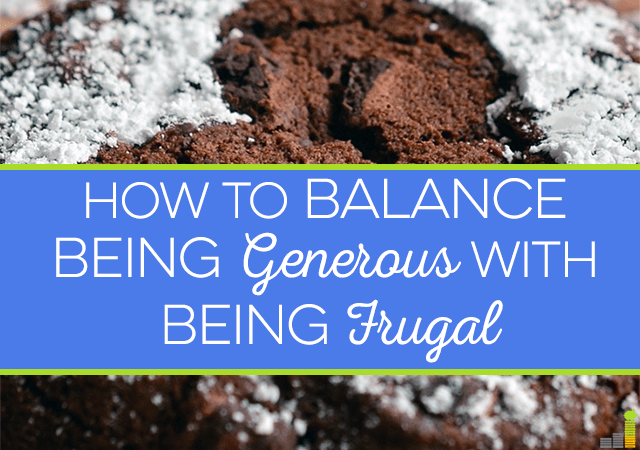 Do you feel like you can’t be as generous as you want to be because of your finances? When did someone surprise you with an act of kindness and how did it make you feel? Offering babysitting is a great way to give of your time. I know some parents never go out because they can’t pay a babysitter. So true – babysitting is great! My neighbor always told us that they don’t have enough food to eat. Sometimes, I gave them to eat foods. I can’t give them cash because I’m also trying to lessen my spending. Your neighbor sounds amazing!! And I agree about how food is one of the most generous things someone can do for you, especially for new moms. My best friend made my husband and I a good 5-6 meals/breakfasts/desserts when we had our second. It was so thoughtful and her food was absolutely incredible. Aw thanks Sarah! Your best friend sounds so sweet! During college, I had a friend who issued a challenge to forget random acts of kindness and instead practice consistent, thoughtful acts of kindness. The challenge really changed my worldview, and its helped me to think of others rather than myself. Like you mentioned, giving generously doesn’t have to cost a lot of money. Giving a ride to someone who doesn’t have a car, inviting new people to dinner, or offering specific help to someone going through a transition or a tough time are all incredible ways to grow in generosity. You hit the nail on the head. 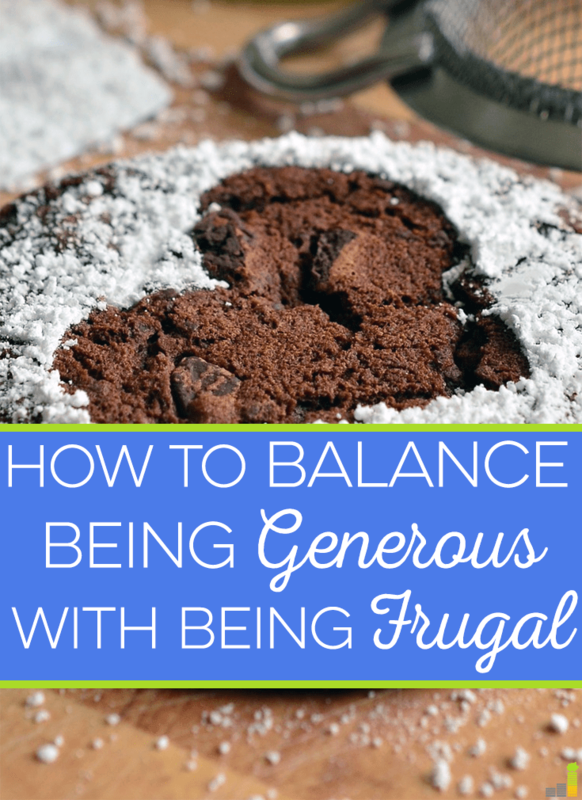 You can be generous and frugal at the same time. Giving your time is often more valued and appreciated because it means you really care. I love to be generous too! 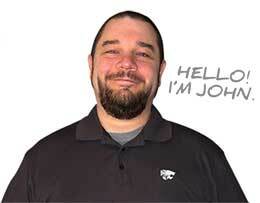 I try not to let it get me in financial trouble, but I like to show people I appreciate them. I can see that about you!